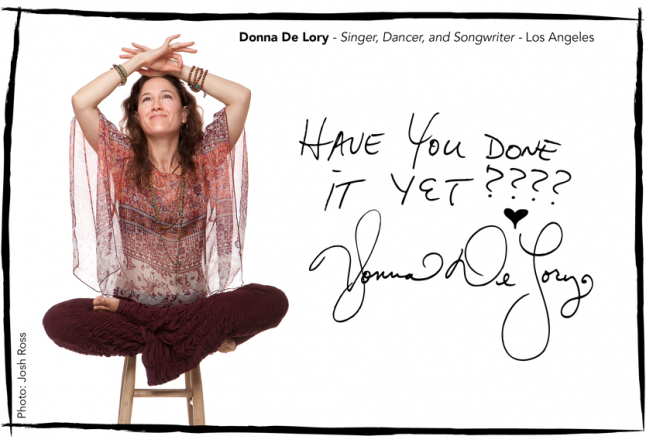 Donna De Lory is an inspirational singer and dedicated yogini. As a singer, songwriter and producer, her music has appeared in various films. She has released several albums and performs all over the country sharing her passion for music and creativity. She wrote the songs with smooth, uplifting electronic beats on her latest album, The Unchanging, with her father in mind. De Lory draws inspiration from nature, which comes through in her soulful music. A California native, De Lory spent some time in Nashville, but eventually moved back to the west coast. As a devoted mother and talented vocal artist, she inspires women everywhere. Yogi Times: You have been invited to join the Yogi Times global project "I AM DOING IT" in order to raise consciousness in the community through your passions. Would you tell us why you have been "doing it?" Donna De Lory: Because it is my joy and peace! It makes me a better, stronger person so I can give and share my gifts. YT: How are you "doing it?" Donna De Lory: By having more and more gratitude every day. By being true to myself, sharing my voice and following my soul's path of service. YT: What motivates you to keep "doing it?" YT: What inspires you to write devotional music? Donna De Lory: My gratitude to the Divine for this beautiful life and this chance to experience love… I am inspired by so many people waking up and coming together to be reminded of the truth that we are all one and we have the power to heal each other and ourselves. For me, music is a deep reminder of the truth that we all come from and return to. I am inspired to create healing and open hearts with the sounds of my music and the intention in my voice when I sing. YT: How has music transformed your life? Donna De Lory: Music has shown me my bliss. It has given me a purpose for my life's work and direction to express my heart. Music has taken me through the most difficult times to the other side; a place of strength and healing. YT: What makes you vulnerable? Donna De Lory: Knowing all that I do not know and all that I do not have control of and being a Mother is a vulnerable experience. Just being alive makes me feel vulnerable. I am humbled by the infinite power of the Divine Mother and the realization of our potential to serve and love unconditionally. YT: You have performed at ShaktiFest, Bhakti Fest and several other yoga music festivals. What's next? Donna De Lory: I will be touring to promote my new CD, "The Unchanging," I just returned from Brazil where I hope to return to next year! The people are so beautiful there! Next week I travel to Boston, then San Diego in Early November and San Francisco in December. I will be touring a lot next year and hope to release a remix CD early in the year and another group of personal songs that I wrote at the piano. Donna De Lory: My daughters, Luciana and Sofia.They inspire me to live more in the moment and to laugh and play more. They also inspire me to be a more loving, compassionate and giving person. Also so many people that are truly giving their lives to service like Amma, The Dalai Lama and Thich Nhat Hanh, to name a few. YT: Which famous musicians do you admire? Donna De Lory: Peter Gabriel, Kate Bush, Emmylou Haris, Michael Franti. There are so many!! YT: How was your experience as a backup singer for Madonna? Donna De Lory: Amazing. I feel like I grew so much as an artist and woman working with Madonna for so many years. It was so fulfilling being a part of her great work and a piece of musical history. Now I carry that experience on with my own music and surround myself with extremely talented musicians and artists as she did. YT: Aside from your passion for music, what other talents and hobbies do you have? Donna De Lory: I love to be in nature, hiking, skiing, biking, playing tennis and practicing yoga, of course. YT: Do you ever get nervous before a performance and how do you help yourself to prepare/relax? Donna De Lory: Sometimes I may get nervous if I am trying out a new piece of music or playing a song on the keyboard that I am not used to playing. I relax by getting in touch with my breath and being present. When I begin to play, I always relax. Connecting with the people that are there to experience this music helps me to feel more comfortable when I am trying something new . The nature of singing the mantras help me get out of my mind and relax in a state of peace. YT: What is your philosophy on life balance and following our passions? Donna De Lory: I believe that we all need to follow our bliss or we will be out of balance with our soul's purpose. I was fortunate to know my bliss from a young age. Being a traveling musician, sharing music and being a mom is not always so easy to balance. I somehow always go back to believing that I can have it all. My practice is to stay clear about what makes me happy, my passion for healthy living, being there to support my daughters and not losing sight of my dreams of sharing my music with the world. YT: What are your thoughts on yoga and meditation? Donna De Lory: It is the path that works for me and that I know I will practice all of my life. The teachings have helped me in so many ways. YT: What can we expect to see from you in the future? Donna De Lory: A lot more music! A lot more service!!! !